Este documento en formato PDF 1.6 fue generado por PScript5.dll Version 5.2.2 / Acrobat Distiller 10.1.3 (Windows), y fue enviado en caja-pdf.es el 21/04/2017 a las 21:09, desde la dirección IP 2.143.x.x. La página de descarga de documentos ha sido vista 5519 veces. Tamaño del archivo: 66.1 MB (312 páginas). Distribution Restriction. Approved for public release; distribution is unlimited. *This manual supersedes FM 3-97.61, dated 26 August 2002.
operations. This pattern will not change; therefore, Soldiers will fight in mountainous terrain in future conflicts. mountaineering skills to overcome adverse terrain to reach an objective. This training circular details techniques Soldiers and leaders must know to cope with mountainous terrain. using TC 3-97.61 for training (see Appendix A). The measurements in this publication are stated as they are used in training (either metric or standard). 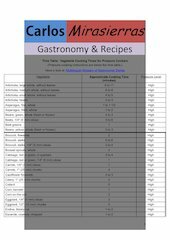 Appendix B contains a measurement conversion chart for your convenience. States (ARNGUS), and the United States Army Reserve (USAR) unless otherwise stated. The proponent for this publication is the United States Army Training and Doctrine Command (TRADOC). Recommended Changes to Publications and Blank Forms. Point of contact information is as follows. the restraints that the terrain can place on a unit. 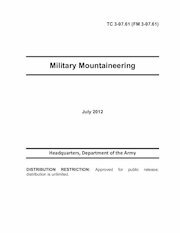 training are important factors in successful military mountaineering. rocks. Calcite, the only one of the seven that does not contain silicone, is found in limestone. discuss the characteristics and hazards of the different rocks and slopes. cracks. Face climbing can be found, however, it cannot be protected. stones may be loose. Limestone has pockets, face climbing, and cracks. 1-7. Slate and gneiss can be firm and or brittle in the same area (red coloring indicates brittle areas). Rockfall danger is high, and small rocks may break off when pulled or when pitons are emplaced. possible, but any outward pull will break off handholds and footholds, and it is usually difficult to protect. are slippery after rain, new snow, and dew. After long, dry spells, clumps of the slope tend to break away. Weight should be distributed evenly; for example, use flat hand push holds instead of finger pull holds. planned to avoid these dangers. Self-arrest should be practiced before encountering this situation. down firn snow if necessary. Firn snow is easier to ascend than walking up scree or talus. injury than scree because of its size. moving with him. Climbers must beware of larger rocks that may be solidly planted under the scree. possible, avoid scree when ascending. 1-13. Rock is classified by origin and mineral composition. creating a volcanic or extrusive rock. weather differently than the main rock mass and form chicken heads. Rockies, Adirondacks, and most other ranges this core is at least partly exposed. sandstone; beds of mud into mudstone or shale; and shell beds and coral reefs into limestone or dolomite. cementing can result in flawless surfaces, especially in limestone. offer high-angle climbing comparable to that of granite. produce gneiss, which is almost indistinguishable from igneous rock. contains heavily metamorphosed schist, which also provides solid climbing. to collide, heaving up fold mountains, and to pull apart and crack, forming fault-block mountain ranges. each other creates earthquakes, volcanoes, ocean trenches, and mountain ridge systems. 1-22. The different horizontal and vertical stresses that create mountains usually produce complex patterns. may strip away the overlying layers, exposing the central igneous core. fault-block mountains. Many forms are created by the motion of these chunks along these faults. between the blocks―fresh scarps many feet high develop. block bends but does not break, leaving a gentler slope from the base of the range to the crest. not have been carved by erosion. fold but then may break, and parts of the rocks are pushed sideways and override neighboring formations. every range of folded mountains in the world exhibits an over thrust of one sort or another. than the surrounding material, it rises and erupts to form volcanoes. These volcanoes are found in belts, which correspond to continental margins around the world. Asian arc, the Caucasus region, and the Mediterranean. Iceland and the Azores, and the Rift Valley of East Africa with Kilimanjaro’s cone. smaller faults that form ledges and gullies may also be present. requires experience in the classifications of routes and understanding the levels of difficulty they represent. Class 3―Climbing, use of ropes for beginners (moderate scrambling). Class 4―Belayed climbing (moderate to difficult scrambling, which may have some exposure). necessary to support balance. This is sometimes referred to as advanced rock scrambling. Class 5.5―Moderate Difficulty. Three points of contact are necessary. where good grips can require moderate levels of energy expenditure. energy expenditure will be experienced. Class 5.8 Very Great Difficulty. Increasing amount of intermediate protection is the rule. High physical conditioning, climbing technique, and experience required. indispensable. Often combined with aid climbing (A0-A4). experience, and energy expenditure. Only talented and dedicated climbers reach this level. Classes are also further divided from 5.9 and below with +/- categories, for example, 5.8+. All Class 5 climbs can also be designated with “R” or “X,” which indicates a run-out on a climb. classic climb and is usually aesthetically pleasing. a sling into a bolt or piece of protection, and then pulling up on it or stepping up in the sling. protection placement below and above the difficult moves, but no serious fall danger. clean and with no serious bodily harm. hold a climber’s weight and falls can be as long as two-thirds the rope length. route can be trusted to stop a fall. whole rope team will probably experience ground fall. the level of the climb will take to complete the route. About three-fourths of a day. Long hard day (usually not less than 5.7). 1 1/2 to 2 1/2 days (usually not less than 5.8). 1-33. Climbing difficulties are rated by different systems, defined below and compared in Table 1-1. Used in the United States. climber is unfamiliar with it. Australia uses only numbers to designate difficulty. Table 1-1. Comparison of rating systems. often prefaced with WI (waterfall ice), AI (alpine ice), or M (mixed rock and ice). 1-35. Commitment ratings are expressed in Roman numerals. A short, easy climb near the road, with no avalanche hazard and a straightforward descent. may require building rappel anchors, and the route might be prone to avalanche. A multipitch route at higher elevations; may require several hours of approach on skis or foot. This route is subject to objective hazards, possibly with a hazardous descent. ever-present, all in a remote area. hazards rendering survival as questionable. Difficult physically and mentally. 1-36. Technical ratings are expressed as Arabic numerals. A frozen lake or stream bed. at placing protection and setting anchors. chandeliers and run-outs between protection. movement and ability to place protection while in awkward stances. pitch, physically and mentally, requiring agility and creativity. Simply the hardest ice climbing ever done; extremely bold and gymnastic. roads or trails are available. problems inherent to mountainous regions. Soldiers be prepared for wide variations in temperature, types, and amounts of precipitation. 1-38. Movement above the timberline reduces the amount of protective cover available at lower elevations. weather changes using materials from his rucksack. use reduced visibility to achieve tactical surprise. can be eaten quickly and while on the move. shelter secured, put on dry clothing. Do not rush. Hasty movement during storms leads to breaks in contact and accidents. If lost, stay warm, dry, and calm. Avoid high pinnacles and ridgelines during electrical storms. Avoid areas of potential avalanche or rock-fall danger. with the surrounding terrain to prevent aerial detection. terrain often produces dead space at midranges. peaks or mountaintops. High wind speeds and sound often mask the noises of troop movement. visual coverage of the battle area. should be considered in maneuver plans. routinely train in range estimation in mountainous regions to maintain their proficiency. major impact on military operations. how well it is understood and to what extent advantage is taken of its peculiar characteristics. Weather often determines the success or failure of a mission since it is highly changeable. excellent means of concealing movements that normally are made during darkness or in smoke. Limited visibility can be used as a combat multiplier. terrain, snow conditions, and weather factors. western portion of the Americas and Asia. be minimized when men have been trained to accept the weather by being self-sufficient. centimeters for every 300 meters gained in elevation (3 percent). The air at higher altitudes is thinner as atmospheric pressure drops with the increasing altitude. with a snow cover that reflects the rays upward. it is being lifted or not. (mb). The higher in altitude, the lower the pressure. The airflow is clockwise and out. Otherwise known as an anticyclone. Generally the winds will be mild. Depicted as a blue “H” on weather maps. The airflow is counterclockwise and in. Otherwise known as a cyclone. Depicted as a red “L” on weather maps. itself, which causes atmospheric instability resulting in bad weather. and lows are called troughs. cold-weather injuries (see Chapter 2). the world’s weather depends on a system of winds that blow in a set direction. to the equator, where it rises and moves to the poles again. prematurely cooled air, due to the earth’s rotation, has settled to the surface. Polar―north of 60o north latitude. Tropical―south of 60o north latitude. Continental Polar―cold, dry air mass. Maritime Polar―cold, wet air mass. Maritime Tropical―warm, wet air mass. Continental Tropical―warm, dry air mass. 1-61. Two types of winds are peculiar to mountain environments, but do not necessarily affect the weather. 1-62. These winds blow up mountain valleys to replace warm rising air and are usually light winds. can hold all that it can the air is “saturated” or has 100 percent relative humidity. Fahrenheit or even below freezing. cool about 5.5 degrees Fahrenheit per 1,000 feet of elevation gained or lost. (thermals) to rise straight up and lift air to a point of saturation. reaches its saturation point. Frontal lifting creates the majority of precipitation. 1-69. This happens when an air mass is pushed up and over a mass of higher ground such as a mountain. Air is cooled due to the adiabatic lapse rate until the air’s saturation point is reached. vertically developed clouds; and less common clouds. cold enough, these clouds may also contain ice particles and snow. typically diffuse and difficult to accurately determine. size of a thumbnail while stratocumulus are about the size of a fist. and altostratus clouds (Figures 1-5 and 1-6). if it were shining through frosted glass. (Figure 1-7 and Figure 1-8). all tangled together. Extensive cirrus clouds are associated with an approaching warm front. cirrostratus. Sometimes the only indication of cirrostratus clouds is a halo around the sun or moon. crystals. As a result, the halo gradually disappears and the sun or moon becomes less visible. 1-80. These are much larger and more vertically developed than fair weather cumulus (see Figure 1-9). from the sun are the strongest. 1-81. These clouds are a collection of miscellaneous types that do not fit into the previous four groups. They are orographic clouds, lenticulars, and contrails. cloud is the lenticular cloud. eighths. Record the coverage in eighths and the types of clouds observed. 1-87. A warm front occurs when warm air moves into and over a slower or stationary cold air mass. cumulonimbus clouds will be seen during the summer months. then cumulonimbus producing a short period of showers. Fahrenheit for every 1,000 feet of elevation gain. climb started in a valley, higher temperatures may often be encountered as altitude is gained. the shade and surface temperatures in the sun. This is particularly true for dark metallic objects. temperatures are greater in valleys than on slopes. considerations primarily with regard to the clothing and equipment needed for an operation. may be quite different because cloud height, temperature, and barometric pressure will all be different. method predicts that tomorrow will be the same. predict that it will travel 300 miles in another 24-hours. the pattern is similar to the following years. (an analogy). This method is difficult to use because finding a perfect analogy is difficult. minor shift in the winds may signal an approaching storm. 1-99. Assess wind direction as a magnetic direction from which the wind is blowing. 1-100. Assess wind speed in knots. If an anemometer is available, assess speed to the nearest knot. objects, such as trees, bushes, tents, and so forth, are blowing. Rain―continuous and steady liquid precipitation that will last at least one hour. Rain showers―short-term and potentially heavy downpours that rarely last more than one hour. Snow―continuous and steady frozen precipitation that will last at least one hour. Fog, haze―obstructs visibility of ground objects. the surface and aloft. Winds commonly exceed 35 knots. clouds are not touching terrain, then estimate to the best of your ability. Celsius: C = F minus 32 times .55. To convert Celsius to Fahrenheit: F = 1.8 times C plus 32. 1-107. With a barometer or altimeter, assess the pressure trend. A high pressure moving in will cause altimeters to indicate lower elevation. A low pressure moving in will cause altimeters to indicate higher elevation. 1-108. Note changes or trends in observed weather conditions. differential of pressure (greater wind speeds). Changes in obstructions to visibility. Increase in precipitation. A steady drizzle is usually a long-lasting rain. Marked cooler temperature changes, which could indicate that a cold front is passing through. Steady wind direction, which indicates no change in weather systems in the area. Clearing of obstructions to visibility. Increasing height of cloud ceilings. 1-109. Continue to evaluate observed conditions and update the forecast. objective and subjective hazards are referred to as cumulative hazards. dehydration, climbing above one’s ability, and poor judgment. ability, a hold breaking away, or other reasons. have to be tied down. situation, tour, or a short climb is seemingly low of dangers. example, storms, rockfalls, icefalls, and lightning. high-altitude illnesses. Storms can form quickly and lightning can be severe. tactical situation does not require it, plan route so as not to get caught by darkness. better because the warming of the sun will loosen stones and cause rockfalls. the time of day or time of year. One cubic meter of glacier ice weighs 910 kilograms (about 2,000 pounds). If you must cross these danger areas, do so quickly and keep an interval between each person. must be taken when moving off of or onto the glacier because of the moat that is most likely to be present. July could turn into a snowstorm in less than an hour. Always pack some sort of emergency gear. more frequent and denser fog on the windward slope. Above about 8,000 feet, snow can be expected any time of year in the temperate climates. metal objects (summit crosses and radio towers). water, cracks filled with earth, shallow depressions, shallow overhangs, and rock needles. (depressions, caves). Keep at least half a body’s length away from a cave wall and opening. rappelling, touch the wall with both feet together and hurry to the next anchor. protective clothing and plan the route to be finished before bad weather arrives. snow. Always wear or pack appropriate clothing. If it is snowing, gullies may contain avalanches or snow sloughs, which may bury the trail. occur in the summer with accumulations of 12 to 18 inches; however, the snow quickly melts. sunglasses, even if overcast. Drink plenty of fluids. 1-125. Slope stability is the key factor in determining the avalanche danger. 1-130. Various factors trigger avalanches. occur during the warmer midday. especially when accompanied by wind, are usually responsible for major periods of avalanche activity. Rain falling on snow will increase its weight and weakens the snowpack. 1-134. Most victims trigger the avalanches that kill them. 1-135. Passing helicopters, heavy equipment, explosions, and earth tremors have triggered avalanches. 1-136. Snow pits can be used to determine slope stability. smooth the face with a shovel. Conduct a shovel shear test. column, use a rope or string to saw from side to side to the base of the column. for the varying methods of tapping the shovel. and land on the block. 1-137. There are two types of snow avalanches: loose snow (point) and slab. loads them with additional snow. and frequent rain are the most common areas for this type of avalanche. generally considered more dangerous than loose snow avalanches. rapid temperature changes. Packed snow expands and contracts with temperature changes. equipment. Put your hood on. Close up your clothing to prepare for hypothermia. Deploy avalanche cord. can act as a flotation device, as well as protect your spine. members of the group should move in the same track from safe zone to safe zone. 1-141. Selecting the correct route will help avoid avalanche prone areas, which is always the best choice. Always allow a wide margin of safety when making your decision. the valley, far from the bottom of slopes. lunch and rest stops. Spend as little time as possible on open slopes. moving during these periods. Moving at night is tactically sound and may be safer. 1-142. Look for nature’s billboards on slopes similar to the one you are on. 1-143. Look for recent avalanches and for signs of wind-loading and wind-slabs. 1-144. Avoid any slopes showing cracks. having their mouths and noses plugged with snow. When you sense the slowing of the avalanche, you must try your hardest to reach the surface. Several victims have been found quickly because a hand or foot was sticking above the surface. Table 1-2. Avalanche hazard evaluation (GREEN-YELLOW-RED) checklist. as possible, preferably under severe conditions so the Soldier gains confidence. • Temperature and altitude extremes. • Limited living space (difficulty of bivouac). 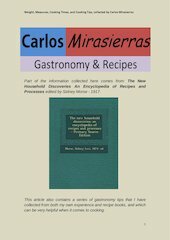 water-location, fire-building, and food-finding techniques (FM 3-05.70). perspiration, and urination must be replaced if the Soldier is to operate efficiently. Conserve water for drinking. Potable water in the mountains may be in short supply. Do not contaminate or pollute water sources. Snow, mountain streams, springs, rain, and lakes provide good sources of water supply. Purification must be accomplished, however, no matter how clear the snow or water appears. one to two minutes. Filtering with commercial water purification pumps can also be conducted. protected from freezing by storing it next to a Soldier or by placing it in a sleeping bag at night. Water should be collected at midday when the sun thaw available. require personnel to heat their individual rations. Weight loss during the first two to three days at high elevation. A loss of appetite with symptoms of mountain sickness. Loss of weight usually stops with acclimatization. sickness and is digested better than fat at high altitudes. three components must be provided in the correct proportions to maintain a healthy body. 2-7. Proteins consist of a large number of amino acid units that are linked together to form the protein. The amino acids, resulting from digestion of protein, are absorbed through the intestine into the blood. 2-8. Proteins are used to make or replace body proteins (muscle and body tissue). balanced in essential amino acid composition than are meat, egg, or milk proteins. digestion and may facilitate dehydration. 2-12. Proteins provide the body about four kilocalories of energy per gram. 2-13. Proteins require more energy than fats or carbohydrates to digest. 2-14. Fats are the body’s natural and most concentrated source of stored food energy. 2-15. Main sources of fats are meats, nuts, butter, eggs, milk, and cheese. 2-16. Of the total daily caloric intake, 25 to 30 percent may be supplied as fats. 2-17. Fats require more water and oxygen to digest than protein. 2-18. Fats provide the body around 9 kilocalories of energy per gram. liver. Larger amounts are converted into fats and stored in that form. 2-21. Carbohydrates are an important source of calories. 2-23. Carbohydrates should comprise up to 50 percent of the total daily caloric intake. 2-24. Carbohydrates provide the body around 4 kilocalories of energy per gram. 2-25. Carbohydrates are easier to digest than proteins. should be considered, especially if this period is to exceed 10 days. necessary to ensure adequate levels of these vitamins. 2-29. Required minerals are contained in a balanced diet (meats, vegetables, fruits). amounts of only a few milligrams a day such as iodine, iron, and zinc. calories per hour (estimate based on a 100-pound person). With an abrupt ascent to high altitudes, the Soldier experiences physiological acclimatization. diuretics, the consumption of these beverages should not be relied upon for hydration. away from equipment and ammunition. At higher elevations, the cooking time may be doubled. items and garbage are carried with the unit. If possible, garbage should be burned or deep buried. sites. As all missions are tactical, no trace of a unit should be detected. operating in extremely cold conditions or at high altitudes. Este archivo fue compartido por un usuario del sitio. ID del documento: 00041334.